Let’s start here. The top six in our projected average ratings are Topalov, Giri, Grischuk, Kramnik, Aronian, and So. It is basically guaranteed that the two ratings qualification spots will go to two of these six players, with the last two themselves being extremely unlikely, and nobody else has a chance worth considering. 7th place Ding Liren could see his rating rise to 2832 tomorrow, and stay there for all three of the remaining lists, and if Wesley So’s rating didn’t change So would still finish ahead of Liren in the final average ratings (by a tenth of a point). The gap is just too big for Liren to have much chance of bridging, and that’s just to get into sixth place in the race, which won’t be good enough to actually qualify. So, currently in sixth place, is only in our list of “serious contenders” because if HE makes huge gains he could climb as high as fourth, and have a shot if two of the players ahead of him reach the finals of the World Cup, removing themselves from contention as qualifiers by rating by qualifying in a higher precedence way. For Liren to get to fourth place, without anyone else’s ratings changing, he would need to post a published rating of 2854(!) in all three remaining lists. Obviously this won’t happen. There are at most six contenders, and Aronian and So are huge longshots themselves (relying on huge rating changes AND two of their competitors to qualify at the World Cup). We will address their path, but each of them has well under a 1% chance of qualifying, it’s over 99% that both qualifiers will be from the top four: Topalov, Giri, Grischuk, and Kramnik. Veselin Topalov has a live rating of 2813. If this is his published rating in each of the remaining three rating lists, his average rating through the year would end up at 2806.6, while third place Grischuk projects to finish at just 2783.7 with no rating changes. Maybe there is a small chance that Giri could pass Topalov, but even that isn’t likely. For TWO people to pass him, and prevent him from qualifying, would take an impossibly absurd collapse. Let us say, despite the previous point, that he somehow plays a couple rated games in September and his rating falls to 2800 in the October supplement (0/2 against a 2700 opponent would do it). Then let us say he goes into a complete tailspin between the World Cup and the European Club Cup (October 18-24) and sheds 50 more rating points, dropping to a published rating of 2750 on the November list. Then let’s say he somehow loses 50 MORE rating points in November, and finishes with a published 2700 rating in the December list. His average rating for the year would still finish at 2790.8 – better than we project for Giri! Of course he isn’t going to lose over 100 rating points in the next two months, but the fact that even if he did he would probably still qualify by average rating should convince you that he’s a lock. There is only one catch: to qualify by rating a player must compete in either the Grand Prix or the World Cup. He skipped the Grand Prix, so the latter is mandatory. Now he has said that he will, and is listed as the #1 seed in the bracket, for this tournament that begins in a week, so our assumption is that he has clinched a spot in the Candidates Tournament. Technically though it’s not official until he actually plays his World Cup games. If for some unforeseen reason he withdrew without playing a game, our understanding of the rules is that he would not be eligible for the ratings qualification. So he has to compete to qualify. If he does, he’s in, and that’s all there is to it. A solid performance at the Sinquefield Cup might have come close to clinching the second qualifying spot for Anish Giri. Through September (the first nine rating lists, out of twelve, that will be averaged together), Giri’s average rating is 2787.4, just barely ahead of Grischuk (2786.9). This would be a minuscule lead, except that Giri is now rated 2798, and Grischuk just 2774. The Sinquefield Cup was Grischuk’s last good chance to close this gap in time to remain in contention, and while he played well (gaining 3 rating points), he did not make the extraordinary move he needed to catch up, nor did Giri stumble (gaining 5 rating points of his own). Now we expect these ratings to be published for October, as we’ve discussed, and one more month of this large rating gap will create a big deficit for Grischuk to try to bridge in the final two months. To catch up, assuming the October ratings match current live ratings as we expect, Grischuk’s November and December ratings would have to EXCEED Giri’s by a total of 29 for a tie, or 30 to actually surpass the Dutchman. If all the gains were to be made in November, this could mean “just” a 15 point rating edge, published twice (November and December), but to achieve this (given his current rating deficit) Grischuk would need to gain (and/or see Giri lose) 39 rating points net before the end of November. If Giri gets knocked out of the World Cup early (and preferably for Grischuk fans it would be by losing classical games, not losing on rapid/blitz tiebreaks) while Grischuk makes a deep run, then this could still be in play, but right now it’s pretty unlikely. We’ll certainly keep an eye on their World Cup results, and see if there’s hope for Grischuk, but really he probably should just focus on reaching the World Cup final and qualifying that way, because anything less probably won’t be enough to close the rating gap anyway. What about other contenders? Who else might catch Giri with big gains at the World Cup? Kramnik trails Giri by a lot more, and would need to be rated 40(!) points higher than Giri by the end of November to catch up. Given that he’s currently 21 points lower rated, this seems highly improbable to say the least. Aronian is rated higher than Kramnik or Grischuk, but trails Giri by even more through the first 10 months, and would need to gain an absurd 82 points on Giri by the end of November to catch him in December. Wesley So would need to gain 94 rating points. The point is: only Grischuk can catch Giri, and it will take a strong effort before the end of October (for the November rating list). If Grischuk is the only player with a realistic chance to catch Giri, then why are we mentioning Kramnik, Aronian, and So? Because it might not be necessary to catch Giri in order to end up with one of the two open Candidates berths by average rating. If either of the top two contenders (Topalov or Giri) reaches the finals of the World Cup, and earns a spot in the Candidates Tournament that way, what used to be a battle for third place suddenly turns into a battle for second place. Kramnik is alive for this reason: he does have chances at catching Grischuk. While Grischuk’s average rating so far is higher than Kramnik’s, his current live rating is three points lower. That’s not enough; in order to actually finish with a higher average rating Kramnik will need to be rated 25 points higher than Grischuk on each of the last two lists (for the tie). This is a tall task, but not so unlikely as to discount entirely. He’s already ahead, so he only needs a net gain of 22 points based on results over the next two months to get there. It’s worth noting, here, that we carefully referred to the possibility of Topalov OR Giri reaching the World Cup final. They are on the same half of the bracket (seeded #1 and #4, and slated to potentially face each other in the semifinals if they make it that far), so it’s impossible for both of them to qualify. What are the odds of at least one of them reaching the World Cup final, and opening a window for Grischuk (or maybe for Kramnik)? Our latest World Cup odds say that Topalov should reach the finals 24% of the time and Giri 18.6%. Since their chances are mutually exclusive, this is the rare situation in probability where we can just add two numbers together and get a valid result, so assuming Grischuk holds on to the #3 rating spot, he has a 43% chance of qualifying for the Candidates Tournament by virtue of Topalov or Giri qualifying on World Cup results and turning Grischuk into the #2 average rating among eligible players. None of this yet addresses Aronian or So. Their odds of catching Grischuk for the #3 spot are lower than Grischuk’s chances of catching Giri were, as they would need to gain 43.5 and 55 net rating points (respectively) worth of ground to catch Grischuk. Unlikely. However there’s still another scenario. While Topalov and Giri can’t both reach the finals, Grischuk himself could, he is seeded #7 putting him on the other half of the bracket. And our calculations say he has about a 10% chance of reaching the final himself. Aronian and So are in trouble, but not completely eliminated. Their hopes rest on a series of unlikely events. First they must root for Grischuk to reach the final, and for his opponent to be either Topalov or Giri. There’s slightly better than a 4% chance of this happening, but that’s about what Aronian’s odds of winning the Sinquefield Cup were when the event began! This is just the beginning though, if two of the top three players in the current average rating standings remove themselves from the pool by both making the World Cup finals, that still only improves Aronian and So to 3rd/4th in the standings themselves. They would ALSO have to catch and pass Kramnik to ultimately get in. Looking at it the same way we’ve looked at other deficits, Aronian would have to gain 22 net rating points on Kramnik to pass him, and So would need to gain 33. These are large deficits, but not completely insurmountable. It’s as likely for Aronian to pass Kramnik as it is for Kramnik to pass Grischuk, and it’s more likely for So to pass Kramnik than it is for Grischuk to pass Giri. All of these look unlikely, but none of them can be completely ruled out as impossible at this juncture. Right now the gaps between each player are large enough that it seems extremely unlikely to come down to a tie. Average ratings are rounded to two decimal places, so two players would have to have EXACTLY the same average rating over the 12 months for it to matter. For the record, though, if two players do tie for second place the tie break is number of standard rated games played in 2015. If anyone wants to go compile game counts for the players in the hunt and post it in the comments, that would be welcome! If after the October and November lists are published (and World Cup finalists are known) a tie begins to look more likely, we’ll drill down more closely on tie break possibilities, but right now it appears irrelevant. What about games played in November? All the numbers we gave above for how many rating points a player must gain (or the person they’re chasing must lose) before the November rating list is published, in order to pass someone ahead of them, naively assumed that the November and December rating lists would be the same. Of course this is not the case, the European Team Championships are played in November, and likely all of these players will compete, so December ratings will differ from November ratings. It’s just that rating changes that only apply on the December list are only counted once, while rating changes that impact the November list are counted twice, so it takes more effort to catch up in the final month. Of course, though, when we said (for example) that Grischuk needs to gain 39 points (net) on Giri before the November list is published, he could alternatively achieve the same result by gaining 33 points (net) before the November list, then gaining 12 more before the December list is published. However far short of a goal someone falls on the November list, they have to gain twice the difference in that final month. So what are the actual odds? The pairings have been drawn for the fourth and final event in the 2014-2015 FIDE Grand Prix. Games begin in just over 6 hours! Here is our look at the event, to whet your appetite. First and foremost, this event is critical because it will determine the final Grand Prix standings, which in turn will determine two of the eight candidates for the 2016 World Chess Championship match against defending champion Magnus Carlsen. The top two players in the Grand Prix standings will join six others in a Candidates Tournament in early 2016, with the winner of that event slated to take on Magnus later in the year. Without the relevance to the World Championship, it’s unlikely this event would be of quite so much global interest as it is – although it’s also certainly a wonderful showcase of 12 fantastic chess players in its own right. Worth mentioning is that third (and possibly even fourth) place in the final Grand Prix standings could also matter. The official rules for the Candidates Tournament say that the first qualifier is the loser of the 2014 match (Viswanathan Anand), and the second and third qualifiers are the top two finishers in the 2015 World Cup, which will be held later this year. The top two Grand Prix finishers *not already qualified* earn spots four and five. It’s relatively unlikely that one player will finish top-two in both events, but it’s not impossible that someone like Fabiano Caruana might do so, and in that case the third place Grand Prix finisher would earn a spot as well. Furthermore, if any player who qualifies for the Candidates Tournament is unable to participate, or chooses to withdraw, then the first alternate candidate is the third place finisher from the Grand Prix. How do the standings work? Each of 16 players competes in three of four tournaments. They earn Grand Prix points based on their finish in each event, ranging from 170 points for a clear first place (not tied with anyone) down to 10 points for a sole last place finish. Each player totals their points from the three events, and the player with the most total points wins the Grand Prix! Of course most audience members aren’t concerned with just the winner, we’re also watching closely to see who finishes second. So what will happen? We can’t know of course, that’s the fun of watching. However we have designed a model to predict the results. Using each player’s current live rating from 2700chess.com we can estimate odds of a white win, a black win, or a draw for every game that will be played. 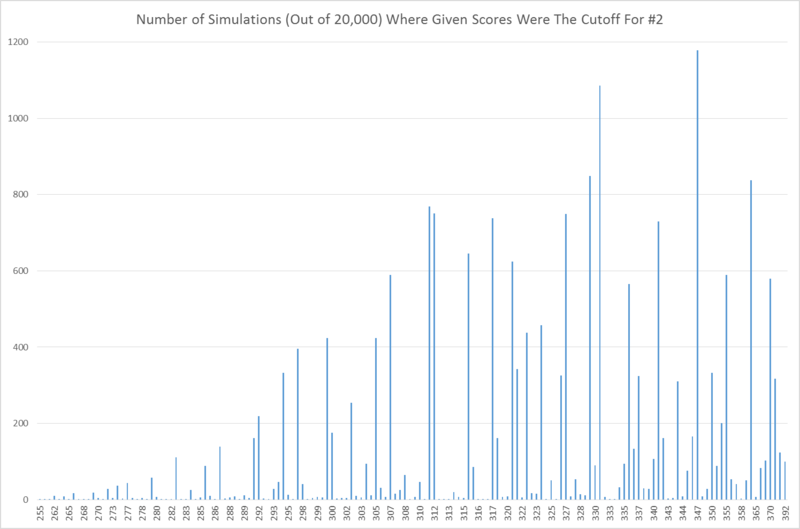 We then simulate the event 20,000 times, tally up each player’s finish (and the resulting final Grand Prix standings) after each simulation, and tabulate the results for your reading pleasure! So enough with the prelude, who are our combatants? Evgeny Tomashevsky – 2749 – currently ranked #15 in the world. Tomashevsky leads the Grand Prix standings with 252 points, driven by an absolutely stellar performance in the third leg held in Tbilisi in February. He entered that event as an underdog, rated just 2716, and given just a 2% chance of finishing in the top two of the final standings by our model. However he crushed that field, winning five games and drawing the rest, winning clear first by a huge margin of a point and a half, and earning 170 GP points (and 29 rating points) for his efforts. The performance was so remarkable and unexpected that it prompted us to take a deeper look at whether we should have seen it coming. Now our model gives him a much more impressive 51.8% chance of holding his lead and earning one of the coveted candidates berths. His job is not yet complete though. Even with his rating improved to 2749 our model still views Tomashevsky as more likely to finish in the middle of the pack than on top, projecting him to earn an average of 65 GP points from this final leg and giving him only a 3% chance of winning this event outright like he did the last one. He’s bucked such odds in the past, but two highly rated challengers are nipping at his heels, ready to soar past him if he should stumble this time around. One extra challenge in holding his spot: he has to play six games as black and only five as white. Fabiano Caruana – 2803 – currently ranked #3 in the world. Caruana is second in the current standings (ignoring players who already completed their three events and are completely eliminated from contention for the top two spots) with 230 Grand Prix points. He got there by tying for first place in leg one, and adding a middle of the pack result in leg two. As the highest rated player in the field, and with the extra advantage of six games as white, our simulations give him a 17% chance of winning this event outright, while projecting him to earn an average of 106 GP points from the leg. To win, he would need to outscore Tomashevsky by 22 points, and we expect him to do so more often than not (with a 41 point lead in his average projected result). Of course to win the whole thing he also needs to avoid being passed by anyone else, but then again to reach the Candidates Tournament he doesn’t need to win, just finish in the top two. All told, this works out to a 71.1% chance of finishing in the top two of the final standings. Hikaru Nakamura – 2799 – currently ranked #4 in the world. Nakamura is third in the (relevant portion of the) current standings with 207 points. He trails Tomashevsky by a much larger margin (45), and also benefits in our projections from a high rating (although unlike Caruana, he has the tougher draw with six black games). We expect him to score an average of 99 points in this event, with a 14% chance of winning it all, and as with Caruana he of course also could qualify for the Candidates Tournament from second place even without catching Toma. Our numbers show him as the smallest of underdogs to finish in the top two, at a 49.1% chance. Might as well flip a coin! Dmitry Jakovenko – 2746 – #17. Tied for (relevant) fourth place in the current standings with 170 GP points, Jakovenko is still in the running if he can swing a good result here. While he has only a 3% chance of winning the event outright, and is only expected to average 68 points from this leg, if he does manage to finish first or second and two of the top three stumble, he’s definitely still alive. We project him to climb into the top two of the final standings and win a berth in the Candidates Tournament 8.6% of the time. Boris Gelfand – 2744 – #18. Tied with Jakovenko for fourth is Gelfand with 170 points of his own. The same principles apply, and their ratings are almost dead even, however his odds are hurt by having the black pieces six times, while Jakovenko only has them five times. He has the same 3% chance of winning the whole event, but projects to average only 62 points. We have him finishing in the top two 7.0% of the time. Sergey Karjakin – 2753 – #12. Next, at #6 in the standings, is Karjakin with 157 points. A slightly higher rating and a good draw (six games as white) actually make his projections marginally better than Gelfand’s, even though he trails currently. We have him averaging 72 points from this event, winning outright 5% of the time, and cracking the overall top two 7.5% of the time. Alexander Grischuk – 2785 – #6. At #7 in the (relevant) standings is Grischuk with just 122 points. That’s an awfully steep hill to climb, but he is the third highest rated player in the field, with six games as white, so his projections are quite good. We expect him to earn an average of 93 GP points, and win this event outright 11% of the time, but even that clear first place result isn’t enough to guarantee he’ll reach the top two position he needs in the overall standings. We expect him to earn a Candidates berth just 3.1% of the time. Anish Giri – 2776 – #10. One of three players tied for (relevant) 8th place with 115 points, Giri at least projects well thanks to his top-ten world rating. A 7% chance of winning the event, and an expected average of 82 points, are nice but he needs a lot of help even if he does win it all. To overcome the massive standings deficit and finish in the top two he needs tremendous luck, as we see it happening only 1.1% of the time. Maxime Vachiere-Lagrave – 2743 – #19. The second player with 115 points, MVL is in even worse shape as due to his lower rating he only projects to score 65 points with a 3% chance to win the leg. His odds of reaching the Candidates Tournament are a meager 0.6%. Baadur Jobava – 2699 – #47. The third player with 115 points is Jobava, who is also the lowest rated player in the field. We give him only a 1% chance of winning the event, and project that he’ll earn an average of only 42 points, although he’s very likely to do it in an exceedingly entertaining fashion given his reputation for playing “exciting” chess! Unfortunately for fans of his style, there is only a 0.2% chance he’ll earn the opportunity to showcase that style in the Candidates Tournament. Peter Svidler – 2736 – #23. In 11th place with just 102 points is Svidler. We all see how this works by now: with a mediocre rating (at least in this field… millions of players around the world would love to be able to call 2736 “mediocre”) he projects to add just 58 points, win the event only 2% of the time, and reach the top two just 0.1% of the time. Or, as optimists everywhere would note: “So you’re saying there’s a chance!” Yes there is a chance. It is approximately 1 in 1,000. Leinier Dominguez – 2737 – #22. Finally we have our last place contestant. Dominguez has just 85 points right now, and unfortunately that’s almost certainly not enough. Even if he came in first, he’d have just 255 points, meaning his best case scenario is a second place finish to Tomashevsky (who will add a minimum of 10 to his current 252). Second place is good enough in the Grand Prix, but it would also require Caruana to finish in the bottom two of the field, and Nakamura to finish in the bottom five, and none of the other contenders to pass him either. 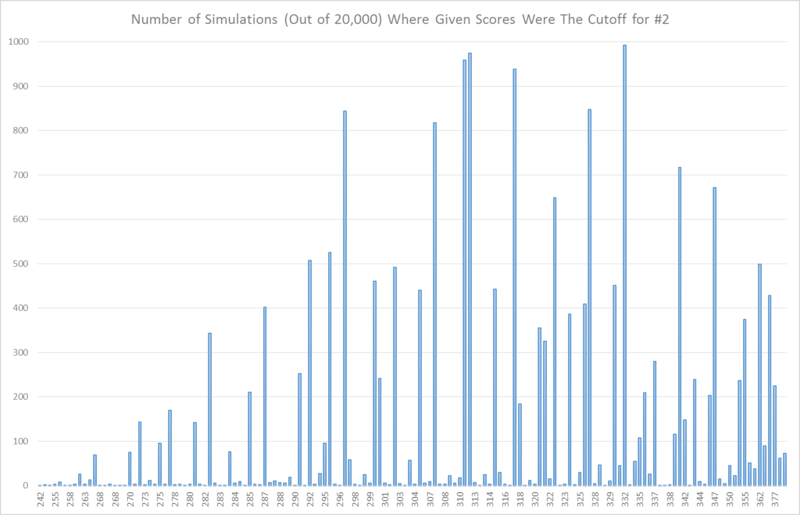 This is not technically impossible, and a previous simulation gave him a 0.003% shot of everything coming together, but our new simulation today that we ran after the official pairings were released did not see him reach the top two a single time in 20,000 times. His odds are essentially, but not technically, zero. These four players have already completed their Grand Prix run, playing the first three events and sitting this one out. Mamedyarov managed the highest score of the group, amassing 235 points, which is enough for him to technically be #2 in the standings at this moment, but that’s a spot it’s impossible for him to hold. It is 100% guaranteed that none of these four will reach the Candidates Tournament by finishing in the top two of the Grand Prix standings. When we referred to players’ “relative” standings above, it was ignoring these four eliminated players, which is why we said Caruana was in second place right now, when technically Caruana is currently third behind the eliminated Mamedyarov. The eagle eyed (or obsessive) among you may have added up the stated odds of each player winning this event outright, and seen that of course they add up to just over 70%. Our simulation predicts a 28% chance that first place in this leg will be a tie between two or more players.